With many of our gardens showing signs of spring, lots of us will be keen to get outside and begin clearing our borders and pruning back those wayward shrubs. Doesn’t it feel good to get outside and start the new gardening year in earnest? It’s great for the body and even better for the soul in my opinion! 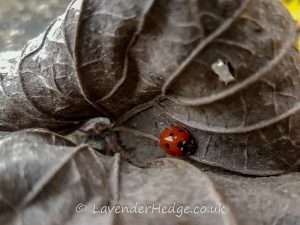 This post is just a little reminder that many insects will be sheltering in the fallen leaves and stems of plants that you may be cutting back. I found this little ladybird today, as I was picking up leaves and moved her to a place of safety and shelter, hopefully to survive the rest of the winter in peace. Hedgehogs will also be hibernating in the undergrowth, so do make a careful check before hacking back and lighting those bonfires!